Volunteers of all ages and all faiths were invited to participate in service projects to benefit local charities. The Sisterhood of Adath Emanu-El synagogue held its fifth annual ‘Day of Tikkun Olam’ event on Martin Luther King Jr. Day. Members of public from all faiths were invited to help take part in various service projects at the synagogue to help local charities. With winds measuring upward of 20 mph, the cold air felt below zero degrees to anyone outside Mt. Laurel’s Adath Emanu-El synagogue this week on Martin Luther King Jr. Day. Yet inside the synagogue, there was a noticeable warmth in the air, even beyond that provided by building’s heaters. 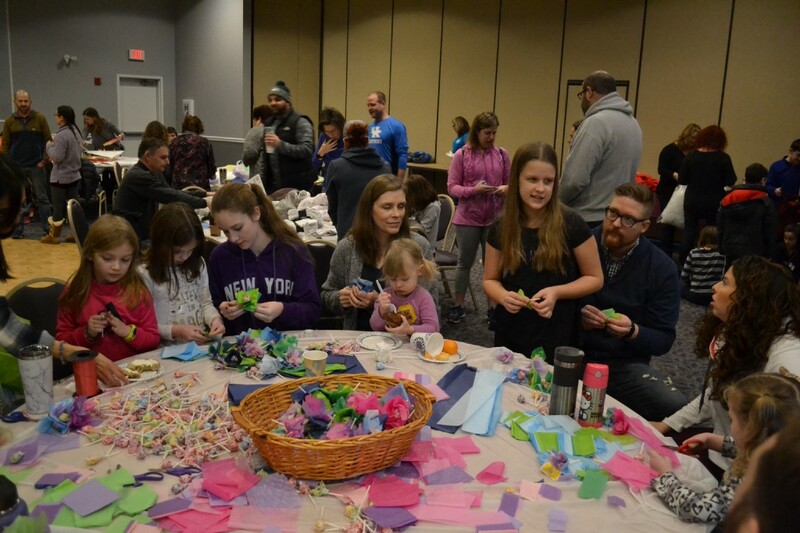 This week marked the fifth anniversary for The Sisterhood of Adath Emanu-El’s “Day of Tikkun Olam,” where volunteers of all ages and all faiths were invited to participate in service projects to benefit local charities in honor of Martin Luther King Jr. Volunteers demonstrated that concept for several hours this week as they made sandwiches for the homeless, assembled craft bags for hospitalized children, created beds and toys for shelter dogs, provided bookmarks and bracelets for Alzheimer’s patients, created tissue paper decorations for hospice patients and more. Caryn Shaw, a member of the Sisterhood and co-chair of this week’s event, said volunteers were working simultaneously on 15 projects befitting about 10 charities. Just some of the charities to benefit from the day’s event include Samaritan Healthcare & Hospice, Cathedral Kitchens, Ronald McDonald House, the Burlington County Animal Shelter, Moorestown Ministerium Food Pantry and others. Shaw said this year’s event was also part of a community-wide day of service across 17 synagogues in Burlington and Camden counties, where each building also held its own service projects. Also helping direct this week’s event was event co-chair Karen Federman-Ellner. Despite the day’s cold weather, she also said she had faith volunteers would arrive on schedule to help as they’ve always done in years past. Federman-Ellner said she also enjoyed seeing how the day had become an intergenerational event over the years, with children, parents and grandparents all in attendance to help others. One of the volunteers at the event was 12-year-old Southampton resident and synagogue member Hannah Foster. Hannah, who was volunteering at the event with Girl Scout Troop №22095, said she was happy to be at the event and she feels good to help those in need.